Nicky Hayden is expected to be fit for next month's Japanese MotoGP, despite his heavy crash in Spain on Sunday. 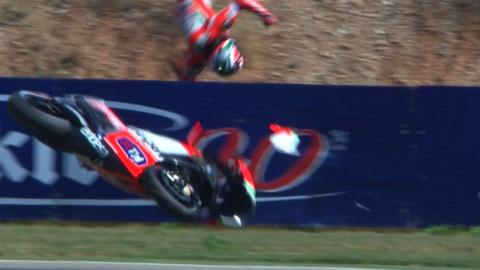 The Ducati rider was thrown from his bike after riding into a wall, but was passed fit after a trip to hospital. "I came up on that wall really fast," he said. "I thought I might hit it headfirst if I jumped off, so I let go right before impact. "I'm sorry to tear up the bike, but I'm thankful for great safety equipment and to be okay." A Ducati team statement said: "Nicky was transported to the circuit medical centre and then to the hospital for precautionary checks. "He has been released and plans to compete in the next round, the Japanese Grand Prix [12-14 October]." Hayden won the world championship in 2006 and has recently signed a new contract to stay with Ducati for next season. Earlier this season he missed the Czech GP after a crash in Indianapolis.